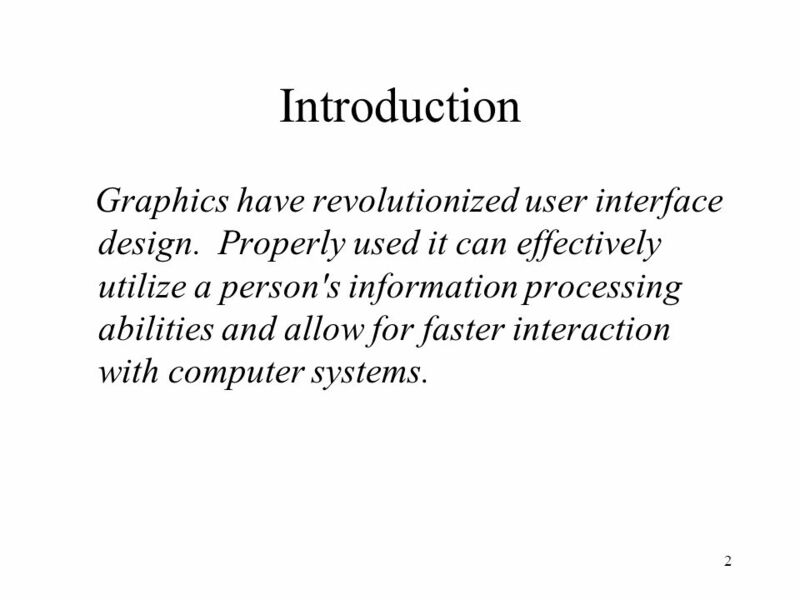 2 Introduction Graphics have revolutionized user interface design. 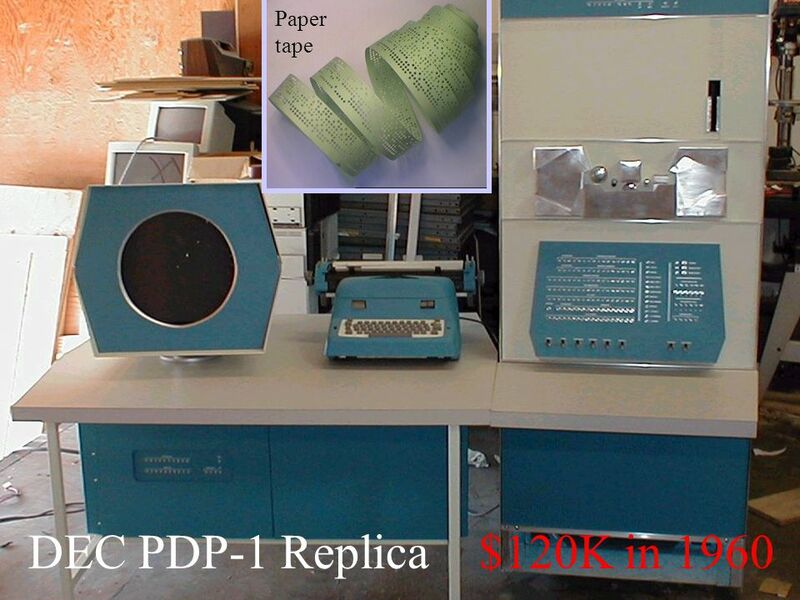 Properly used it can effectively utilize a person's information processing abilities and allow for faster interaction with computer systems. 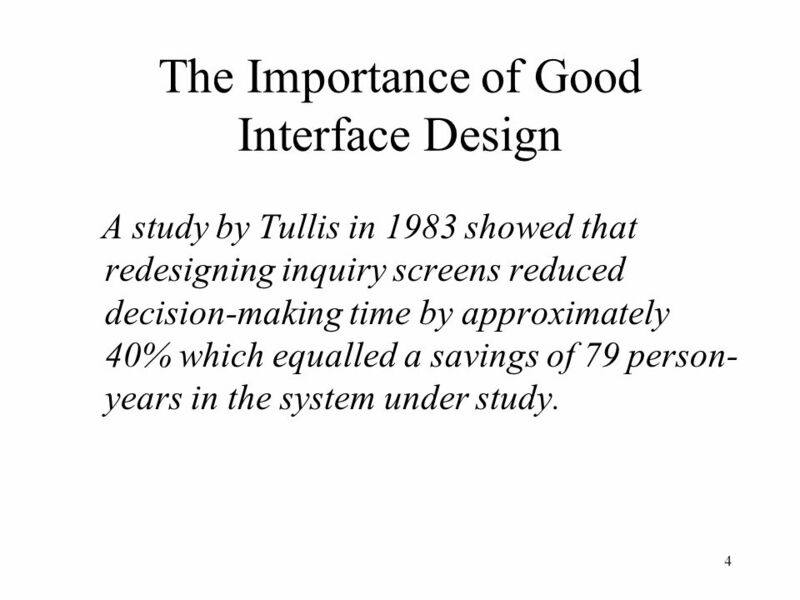 A study by Tullis in 1983 showed that redesigning inquiry screens reduced decision-making time by approximately 40% which equalled a savings of 79 person-years in the system under study. 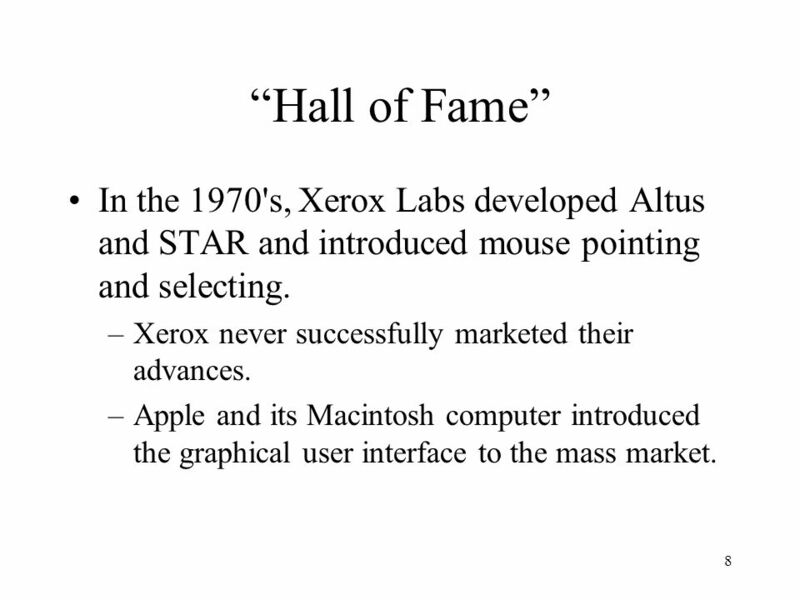 8 “Hall of Fame” In the 1970's, Xerox Labs developed Altus and STAR and introduced mouse pointing and selecting. 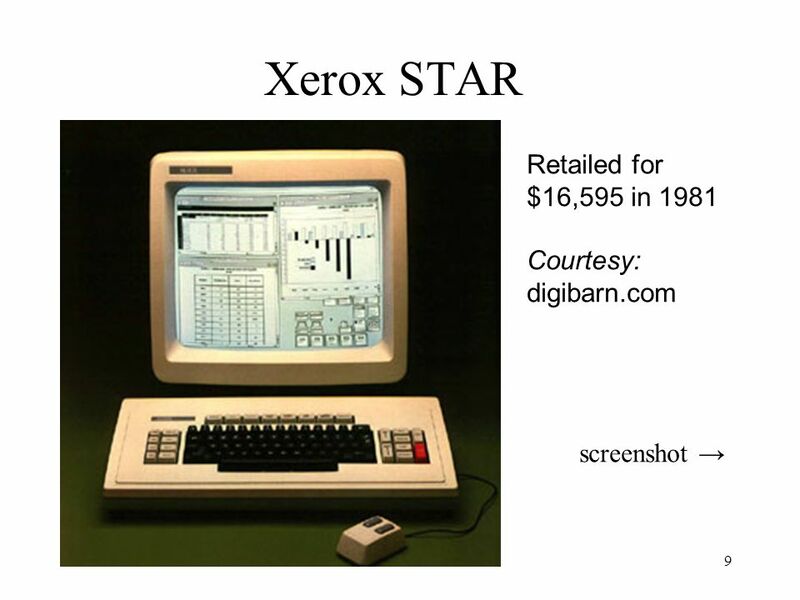 Xerox never successfully marketed their advances. 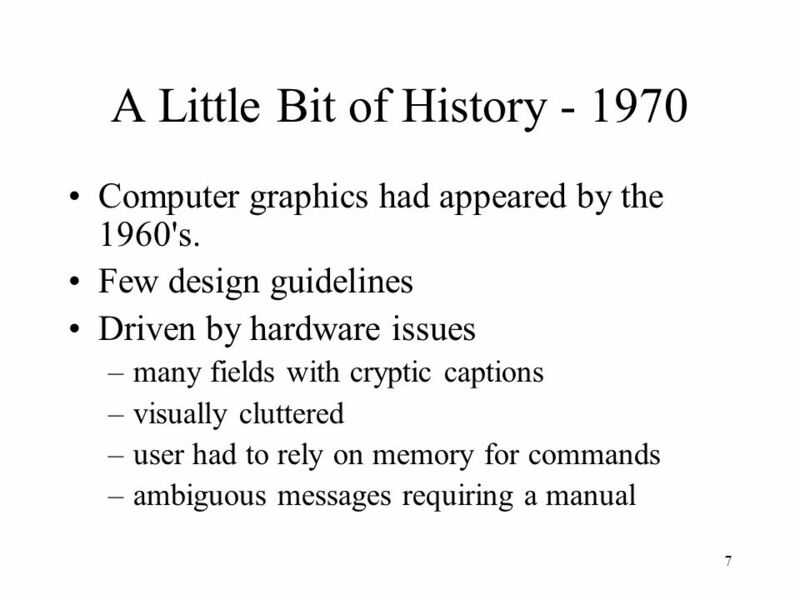 Apple and its Macintosh computer introduced the graphical user interface to the mass market. 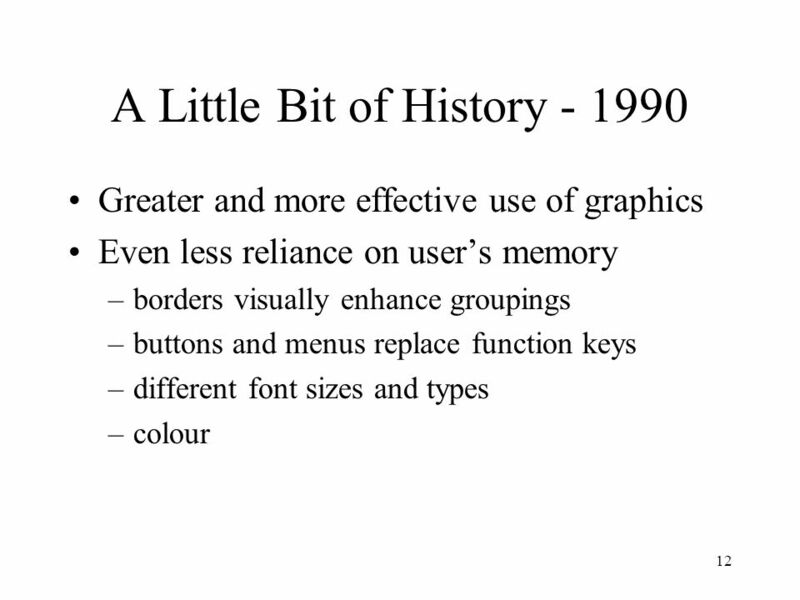 13 Now: Graphics for the masses! What enabled the sudden shift? 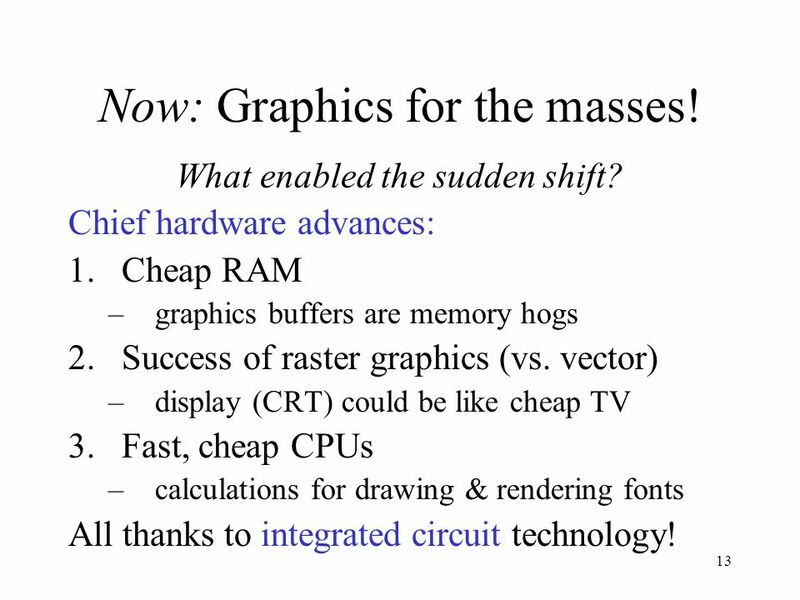 Chief hardware advances: Cheap RAM graphics buffers are memory hogs Success of raster graphics (vs. vector) display (CRT) could be like cheap TV Fast, cheap CPUs calculations for drawing & rendering fonts All thanks to integrated circuit technology! 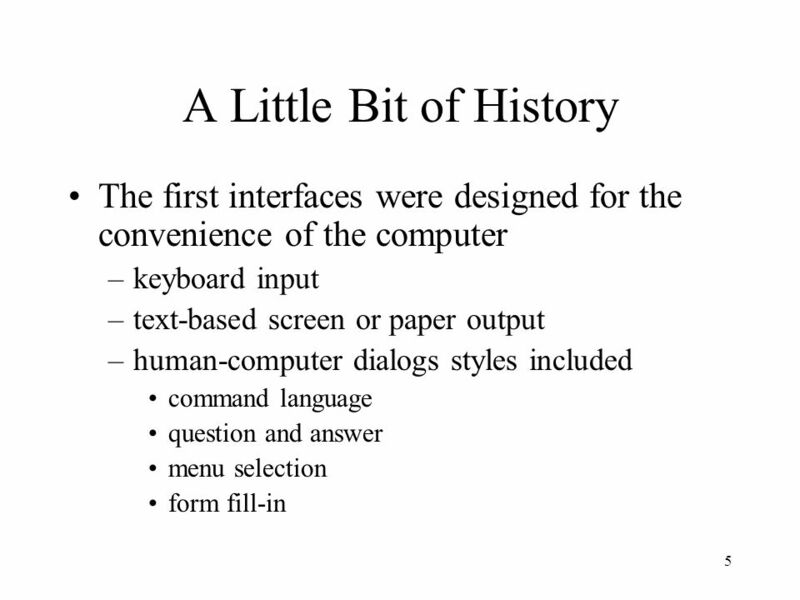 A user interface is a collection of techniques and mechanisms that allow a user to interact with a system. 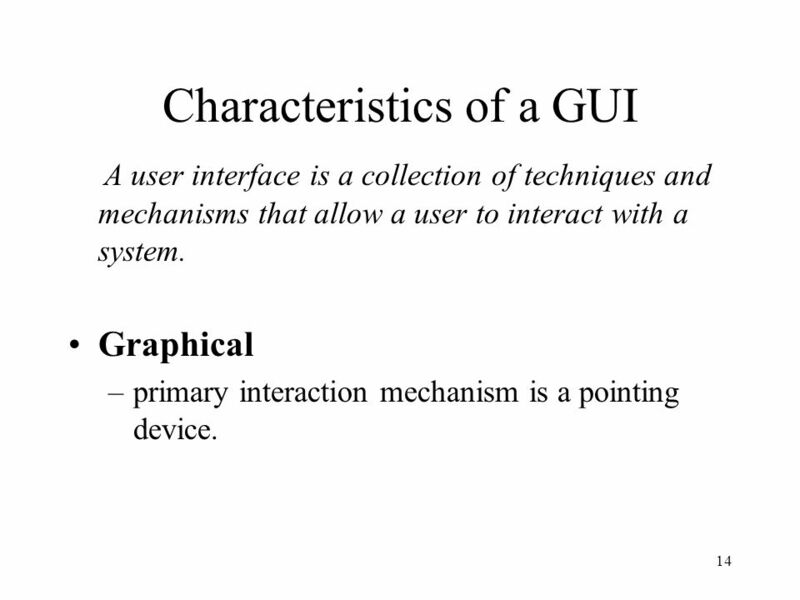 Graphical primary interaction mechanism is a pointing device. 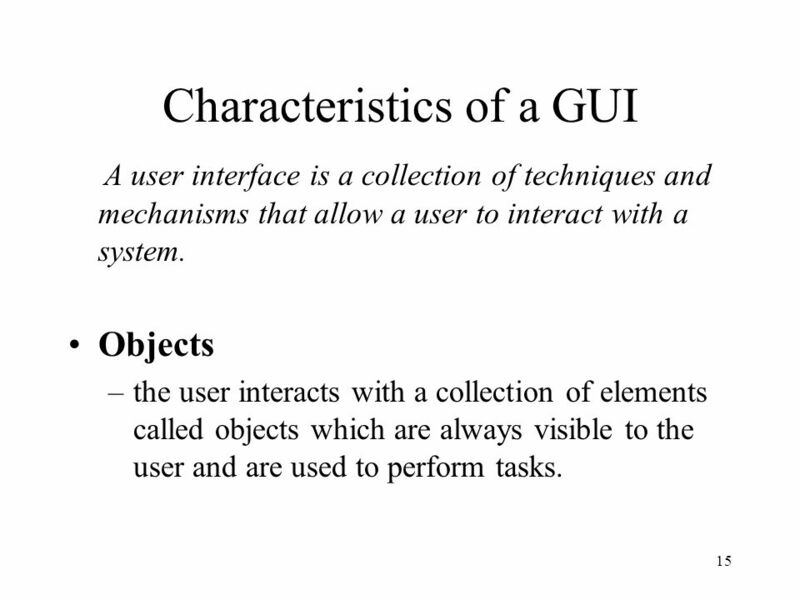 A user interface is a collection of techniques and mechanisms that allow a user to interact with a system. Objects the user interacts with a collection of elements called objects which are always visible to the user and are used to perform tasks. 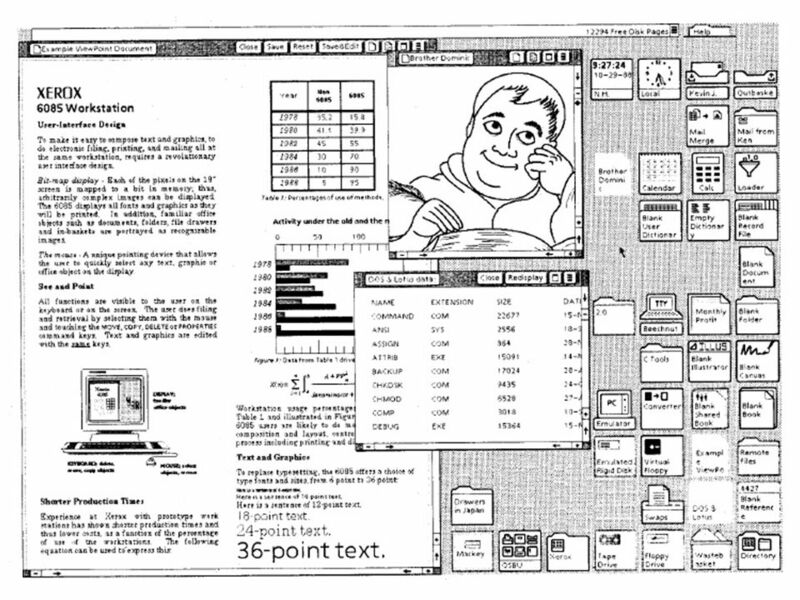 A user interface is a collection of techniques and mechanisms that allow a user to interact with a system. 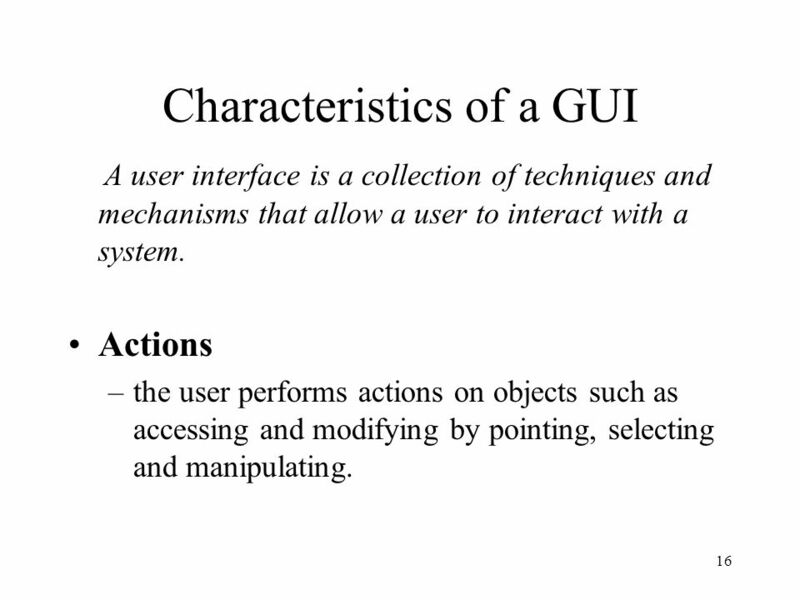 Actions the user performs actions on objects such as accessing and modifying by pointing, selecting and manipulating. 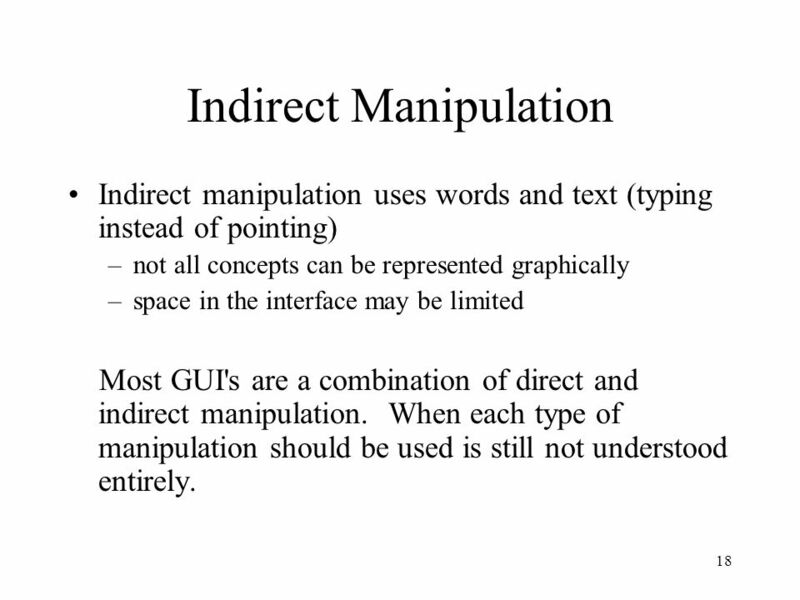 Indirect manipulation uses words and text (typing instead of pointing) not all concepts can be represented graphically space in the interface may be limited Most GUI's are a combination of direct and indirect manipulation. 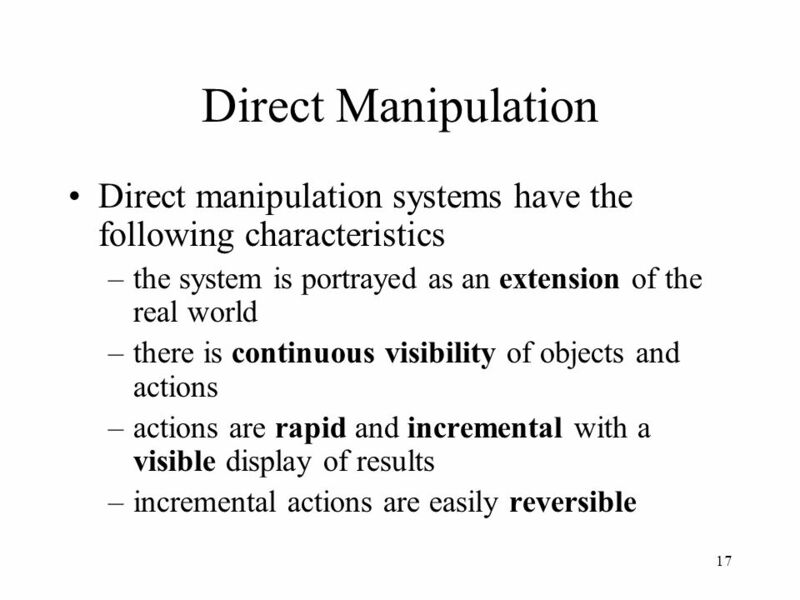 When each type of manipulation should be used is still not understood entirely. 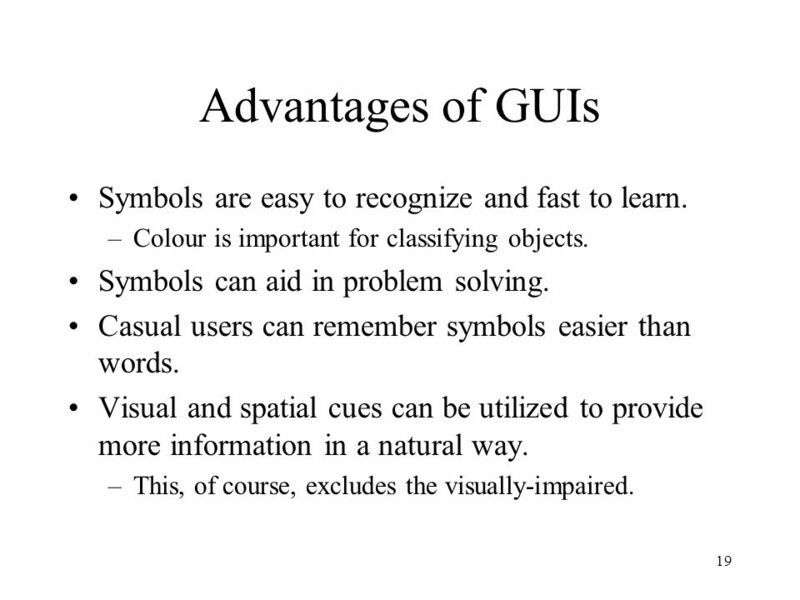 19 Advantages of GUIs Symbols are easy to recognize and fast to learn. Colour is important for classifying objects. Symbols can aid in problem solving. Casual users can remember symbols easier than words. Visual and spatial cues can be utilized to provide more information in a natural way. This, of course, excludes the visually-impaired. 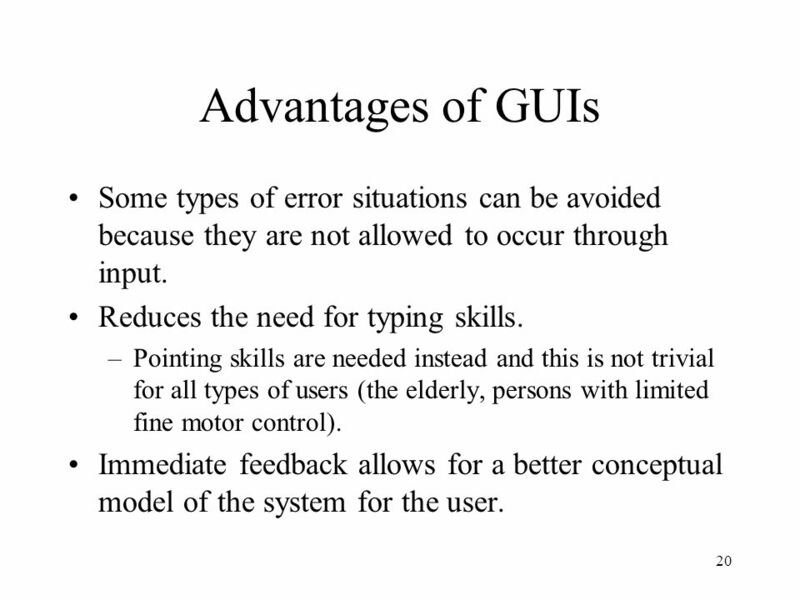 20 Advantages of GUIs Some types of error situations can be avoided because they are not allowed to occur through input. Reduces the need for typing skills. Pointing skills are needed instead and this is not trivial for all types of users (the elderly, persons with limited fine motor control). 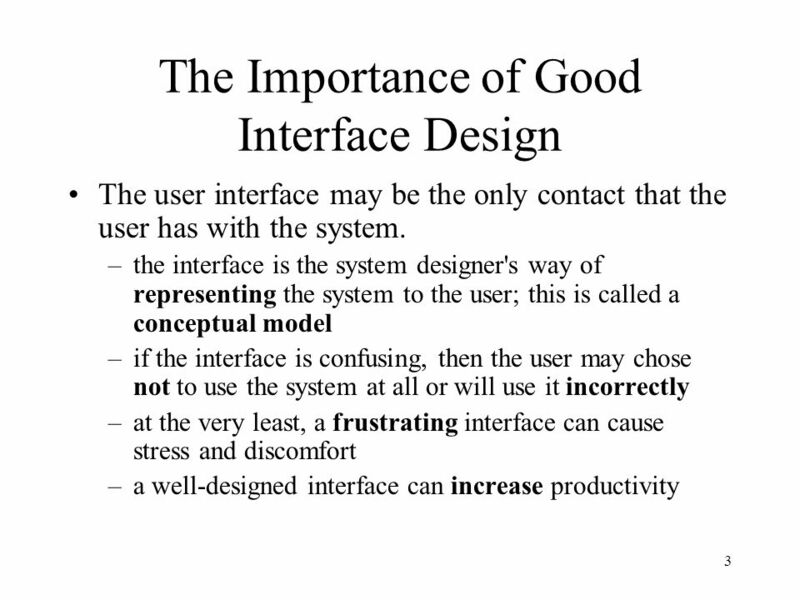 Immediate feedback allows for a better conceptual model of the system for the user. 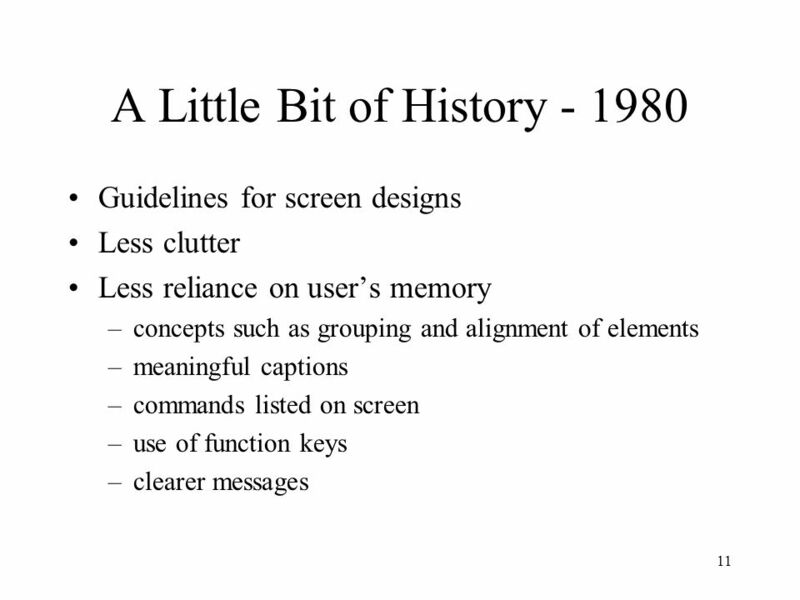 21 Advantages of GUIs More attractive than other interfaces and thus encourages more interaction and exploration. 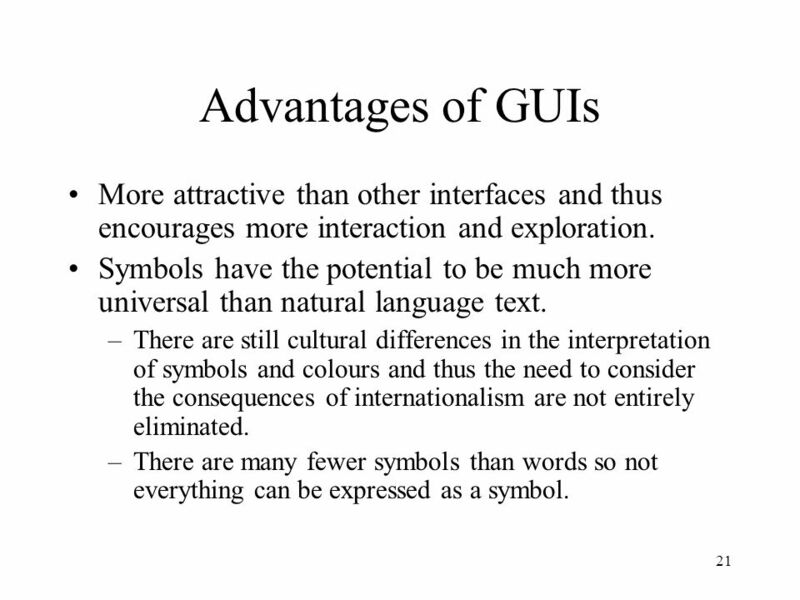 Symbols have the potential to be much more universal than natural language text. There are still cultural differences in the interpretation of symbols and colours and thus the need to consider the consequences of internationalism are not entirely eliminated. There are many fewer symbols than words so not everything can be expressed as a symbol. 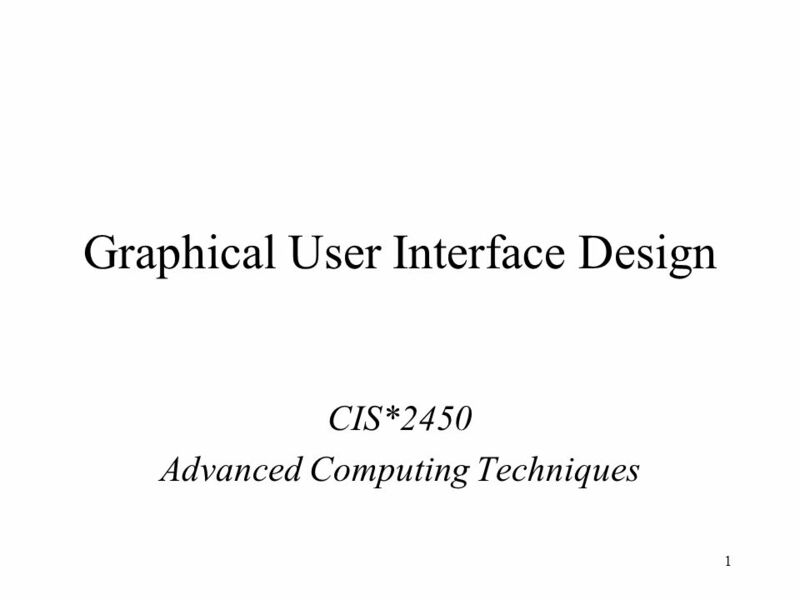 Download ppt "Graphical User Interface Design"
© 2008 The MathWorks, Inc. ® ® Using Instant Messaging to Usability Test an API Rachel Cobleigh Donna Cooper. 1 Inspecting User Interface Quality in Web GIS Applications Juliano Schimiguel M. Cecília C. Baranauskas Claudia Bauzer Medeiros November-2004 UNICAMP. 1 Lesson 10 Working with Tables Computer Literacy BASICS: A Comprehensive Guide to IC 3, 3 rd Edition Morrison / Wells. 1 SEDIT & S/REXX SEDIT and S/REXX Mainframe-caliber tools for UNIX Offered by Treehouse Software, Inc.
CE 311 K Introduction to Computer Methods VB Controls and Events Daene C. McKinney.